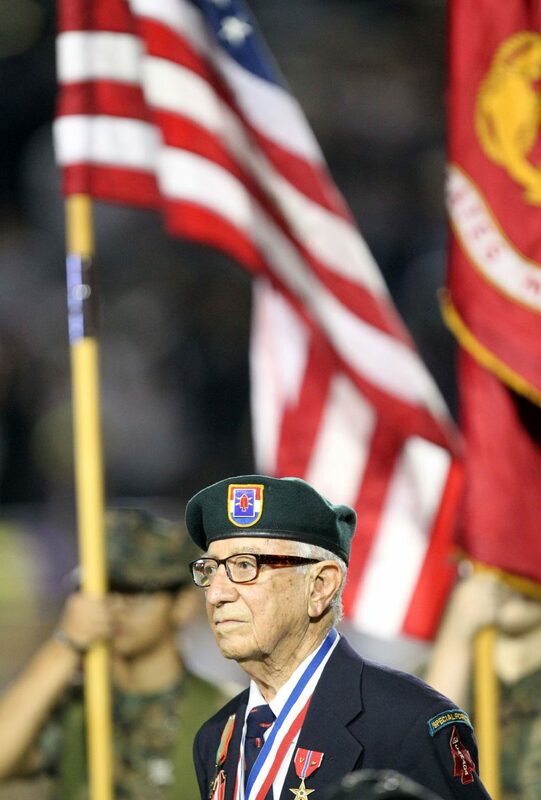 Gutierrez was awarded the Congressional Gold Medal in July 2013 in Washington D.C..is shown saluting the flag during a ceremony honoring the WW II veteran at McAllen Veterans Memorial Stadium on Friday ,Oct. 19, 2018, in McAllen. It was McAllen High versus McAllen Memorial in high school football. It was early in the season and stakes were still high. But when Eugene Gutierrez walked out onto the field, led by McAllen Memorial JROTC instructor Col. (retired) Alfredo Longoria, the game became secondary. A true hero — a World War II hero — was being honored by the McAllen Independent School District. Fans rose — both from the Memorial blue and McHi purple — and gave Gutierrez a long standing ovation. As public address announcer Celso Gonzalez read over Gutierrez’s history, hype for the game turned into awe and respect for the man standing near midfield and dressed in full military attire, his ribbons and medals telling stories beyond many people’s comprehension. 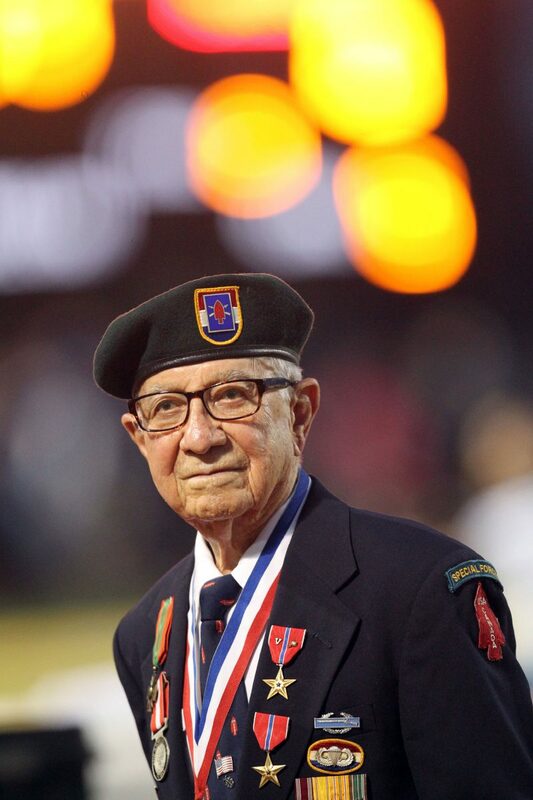 Eugene Gutierrez, 96, a McAllen resident, served in the first Special Service Forces WW II, was honored at McAllen Veterans Memorial Stadium on Friday ,Oct. 19, 2018, in McAllen. He served in an elite unit known as The Devil's Brigade. 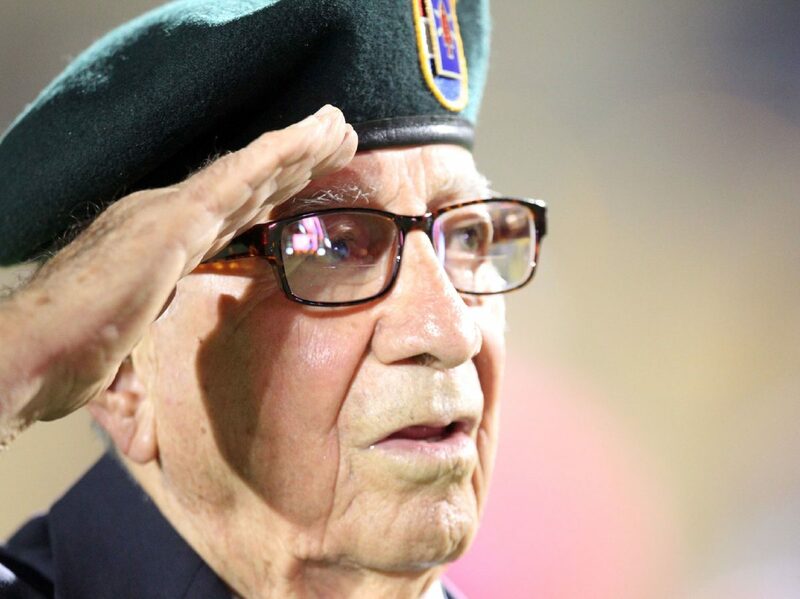 McAllen ISD started Veteran of the Week recognitions in 2016 and they take place a few minutes before kickoff at home games for McAllen Memorial, McHi and McAllen Rowe. Gutierrez served in a unit known as The Devil’s Brigade, an elite regimental-sized light infantry unit created in 1940 composed of 1,800 personnel, half Canadian, half American soldiers and is the forerunner of today’s Special Forces. They were called the elite of the elite. He fought in Europe and once volunteered to cross enemy lines to rescue a badly wounded comrade. A teacher and principal in MISD for 30 years, Gutierrez remains in McAllen with his wife of 66 years, Penny. It was in May of 1944 when Gutierrez, who spent 99 days on the front lines without any relief, said he would go and rescue his comrade, who was left behind due to a very serious abdominal shrapnel wound. Gutierrez went through heavy enemy fire during the rescue. The Special Forces unit was known as “The Devil’s Brigade,” and was endorsed by President Franklin D. Roosevelt. The specifications for the trained soldiers called for “rugged-outdoorsmen-like volunteers for hazardous duties.” The brigade was known as one of the most fierce and deadliest units. The unit would take on many assignments that trained them for any and combat. To prepare for one of their missions, they had less than seven months to become qualified paratroopers, skiers, demotion experts and mountaineers while learning hand-to-hand unarmed and armed combat, winter warfare and other things with critical assignments ahead. Gutierrez graduated high school in 1941 and a couple of months later he joined the Army, planning to learn some engineering skills. Then the attack on Pear Harbor changed his plans, and his life. Gutierrez was awarded the Congressional Gold Medal in July 2013 and also has been honored with two Bronze Stars (one for valor and one for infantry combat, a Liberation of France Medal, a World War Two Victory Medal, a First Special Service Force medal and a Good Conduct Medal. He, his granddaughter and other family members are still waiting on a response in regards to the Medal of Honor.